Praise be! 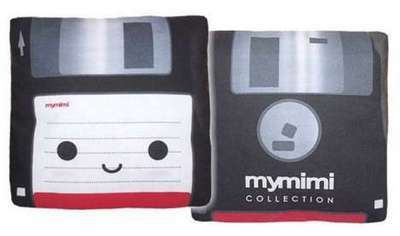 some one has made a floppy-disk pillow (or indeed cushion as we call ’em in the United Kingdom). Geeks have been actively making techie-themed cushions for a while, a phenomenon we covered in Great Geek Cushions. I guess cuddly tech stuff combines the geek’s interest in techie paraphrenalia with their innate desire to huddle, crouched in the fetal position their arms wrapped tight around something soft and yielding. Sometimes the cat moves too fast and a pillow shaped like a floppy disk is exactly what you need. These would be usefully long and thin and would work well as ‘back of the sofa’ or other lean against pillows. Traditionally disk shaped, these would be nice and useful. I’d suggest some reflective thread woven in to get the shiny effect. Yes, these are information storage devices of a sort, they’d also make cool cushions if they had a fold in the middle and you could put your head in the centre and fold it up, burying your head in the cushion with maximum efficiency. And while we&apos;re at it, a geek pillow you won&apos;t want..